Bond wire, a metal wire of only a few micrometers thickness, is used for connections in microelectronics. The wires are machine-welded ultrasonically by the so-called “ball-wedge bond” or “wedge-wedge bond” process. The quality of the bond as well as the shape of the bond foot is critical for the entire electrical component function. If one bond connection is missing or deficient, the entire product will fail. Such risks for sensor manufacturers supplying the automotive industry, where their products often fulfill safety functions, are completely unacceptable. For that reason, a leading provider of sensor technology assigned two companies, SMD Production-Technology (SMD-PT) and WENO, the task of developing a testing system that can check every single bond wire on every sensor. WENO has been developing automation systems for industrial uses since 1982, beyond which they offer customers commissioned production services for precision parts. Furthermore, SMD-PT developed evaluation with AlfaVis software in for use with image recording as well as the development of special illumination systems. On the sensors to be tested, 30 µm aluminum wires (human hair measures between 60-80µm in diameter) are bonded/welded both to the chip as well as to the gold pad. After welding, the wire has only approximately 10-15 µm height, and the width, or deformation, comprises 35µm to 60µm, according to specification. as a rule, tolerance falls within +/- 2-4 µm. Given these parameters , the technical challenge becomes clear: prior to this order, there had been no imaging system on the market that was capable of ensuring precision below 100 µm. 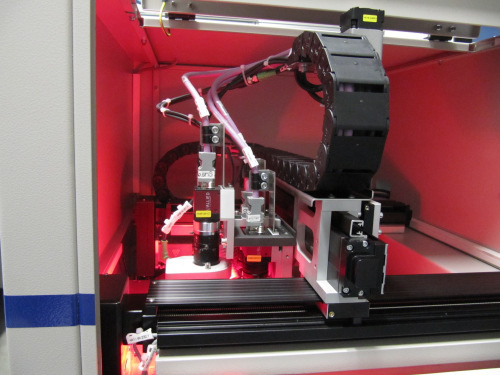 WENO and SMD-PT developed a system to meet these demands: the µ-Precision Inspection System, a unique testing facility offering the highest precision available on the market to date. For the measurement, sensors are placed on a base board in a 10×8 matrix so that 80 sensors can be tested in a single test procedure. Individual sensors are loaded with anywhere between 18 and 26 bond wires, depending on the design, that exhibit both bond positions “source” and “destination”. The board is fed horizontally into the test chamber consisting of two axes, on which digital cameras move over the board together with their illumination units. The system is equipped with three cameras in total. Position correction occurs with the pass of the first camera, using fiducial markings to align the board’s position, which can easily deviate from one measurement procedure to the next, in the test chamber. Using the information ascertained, the positioning mechanics of both remaining cameras are calibrated. 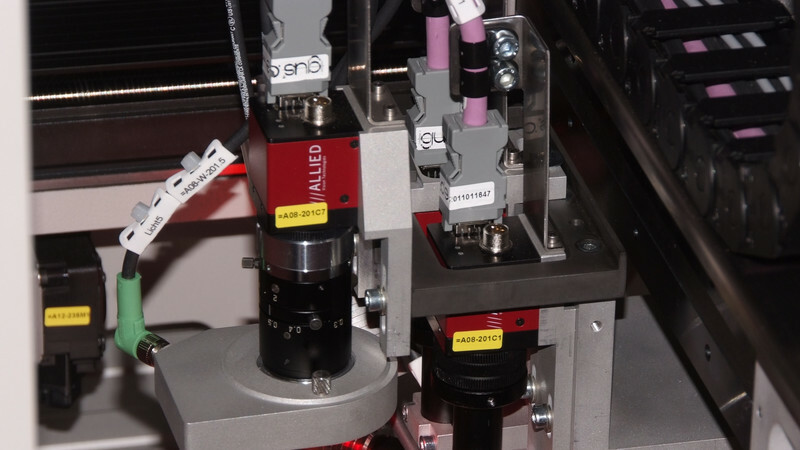 These cameras capture parallel images from two different sensors in more than 2,000 test positions that are mechanically switched with the highest degree of precision. The cameras used are Guppy F-146B monochrome models from Allied Vision Technologies. The Guppy F-146 is a particularly small FireWire camera for industrial inspection applications. Equipped with a 1.4 megapixel CCD sensor, it delivers 17.7 fps at full resolution. Both inspection cameras are equipped with telecentric measurement lenses. With the aid of an LED illumination unit designed especially for this purpose, the contrast between the bond/spot weld and the background is increased. The captured images are limited to an AOI (Area of Interest) of 500×700 pixels providing a resolution of approx. 0.8 µm per pixel. They are then evaluated using software based on the Matrox Imaging Library that has also been specially programmed for this application. Each wire forms an arc between two connection points. On the back of this arc, a light reflection is generated that the software recognizes. Using this information, the wires are counted and tested for integrity. The shape and position of the reflection provide further information about the arc’s height. Finally, the software analyzes the images of the bond spot welds and calculates their dimensions with the highest precision using their geometry. The gap between spot weld and tail is measured as well. Due to the combination of an ingenious illumination concept and patented software, µ-Precision is the only known system that achieves such precision in a single conventional imaging system. All data are recorded and assigned to each individual component for traceability. At the end of a test cycle, the machine displays the measurement board’s matrix on a pressure-sensitive display screen: in an 8×10 grid, error-free components are displayed as green surfaces, while defective ones appear as red areas. If the operator presses on a red area, he/she accesses an image collection of the defective component and can look for the cause of the defect. One defective contact is sufficient reason to reject the entire component.